I love how simple and elegant this looks. Great card. Really like your card. It really does look like they're floating in the breeze right down the card. Thanks for sharing. Kristie, this is so darling! I LOve it when I see self-made papers with these tiny little stamps! Your card is so delightful! I absolutely love the stamp! That little stamp and it makes me so happy! Reminds me of my property in the spring and when the flowers bloom and the seed spores go find a new home and the young children delighting in trying to catch them as they float in the air on the breeze! Love this card. Cant' wait to get the collection. It is looking fabulous. Simple but beautiful! I love the pop of accent color. Isn't that dandelion fun? You did a great job creating your own background! Love the simplicity and the colors are fab. Great card. Blown away (again) by your hand stamped background! Your flawless stamping ALWAYS makes my heart sing! Great idea to create 'movement' by tilting the stamps - it's so effective! Will DEFINITELY be back on Tuesday to throw my name into the hat for some awesome goodies! What a great background. I would never be able to keep it all aligned as you did. Love it. Love the black and white with the pop of color, very nice! awesome card! love the colors as well as the card design. Love this color combo! Gorgeous! Great background, Kristie. I can't wait to order this SOA box this week! I like all of your tiny flowers in the background! This is super cute! Love how simple your card is! 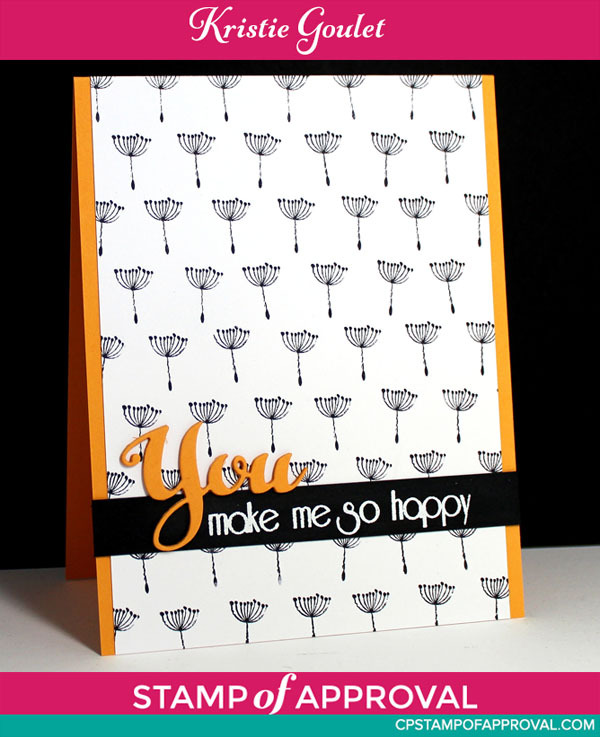 This is so awesome how you used that sweet, delicate little stamp Kristie! This turned out beautiful!! I love your card. It looks like floating umbrellas coming down to visit us. So graceful. Hi Kristie ~ This card instantly took me back to when I was a child, blowing on the dandelion "puffs" and watching them sail through the air. Such wonderful summer memories! I always love seeing your creative backgrounds and have certainly CASed more than one of your ideas. Thanks for sharing with the rest of us! A great background and I LOVE the pop of yellow. Very happy card! Great idea- and it created a really cute card! Love the paper made with those little stamps, Kristie. They remind me of dandelion seeds blowing in the wind. Great background love how simple and pretty it is. I love love this!! I'm always looking for simple ideas and this is a keeper. Great card !!! Love it. I love how simple yet stunning your card is. Thanks for sharing!